TAPPER: Hello again. George Stephanopoulos has the morning off. We are now in the homestretch, just 51 days until the election, and our powerhouse roundtable is standing by to get to all the week's politics. But first, the crisis that has the potential to shake up the presidential race, the murder of four Americans, including the U.S. ambassador, in Benghazi, Libya, on Tuesday, and the wave of anti-American protests and violence now sweeping the globe. For more on what happened and why, let's bring in the U.S. ambassador to the United Nations, Dr. Susan Rice. Dr. Rice, thank you for joining us. RICE: Good to be with you, Jake. TAPPER: So, first of all, what is the latest you can tell us on who these attackers were at the embassy or at the consulate in Benghazi? We're hearing that the Libyans have arrested people. They're saying that some people involved were from outside the country, that there might have even been Al Qaida ties. What's the latest information? RICE: Well, Jake, first of all, it's important to know that there's an FBI investigation that has begun and will take some time to be completed. That will tell us with certainty what transpired. But our current best assessment, based on the information that we have at present, is that, in fact, what this began as, it was a spontaneous -- not a premeditated -- response to what had transpired in Cairo. In Cairo, as you know, a few hours earlier, there was a violent protest that was undertaken in reaction to this very offensive video that was disseminated. We'll wait to see exactly what the investigation finally confirms, but that's the best information we have at present. TAPPER: Why was there such a security breakdown? Why was there not better security at the compound in Benghazi? Why were there not U.S. Marines at the embassy in Tripoli? TAPPER: Not substantial enough, though, right? RICE: ... with our personnel and the consulate in Benghazi. Tragically, two of the four Americans who were killed were there providing security. That was their function. And indeed, there were many other colleagues who were doing the same with them. RICE: ... and where needed. TAPPER: Why would we not have Marines at the embassy in Tripoli to begin with? It would seem like this -- this is obviously an unstable country. This is a region where U.S. interests have been attacked in previous months. Why were there not Marines there to begin with? RICE: First of all, there are Marines in some places around the world. There are not Marines in every facility. That depends on the circumstances. That depends on the requirements. Our presence in Tripoli, as in Benghazi, is relatively new, as you will recall. We've been back post-revolution only for a matter of months. But I've visited there myself, both to Tripoli and Benghazi. I was very grateful to have a strong security presence with me as part of our -- our embassy detachment there. So we certainly are aware that Libya is a place where there have been increasingly some violent incidents. The security personnel that the State Department thought were required were in place. And we'll see when the investigation unfolds whether what was -- what transpired in Benghazi might have unfolded differently in different circumstances. But the president has been very clear. The protection of American personnel and facilities is and will remain our top priority. That's why we've reinforced our presence in Tripoli and elsewhere. TAPPER: It just seems that the U.S. government is powerless as this -- as this maelstrom erupts. RICE: ... was a result -- a direct result of a heinous and offensive video that was widely disseminated, that the U.S. government had nothing to do with, which we have made clear is reprehensible and disgusting. We have also been very clear in saying that there is no excuse for violence, there is -- that we have condemned it in the strongest possible terms. TAPPER: It took two days for President Morsi to say anything about this. RICE: President Morsi has been out repeatedly and said that he condemns this violence. He's called off -- and his people have called off any further demonstrations and have made very clear that this has to stop. RICE: Now, and -- and same, frankly, in Tunisia, in Yemen, and, of course, in Libya, where the government has -- has gone out of its way to try to step up security and express deepest remorse for what has happened. We are quite popular in Libya, as you might expect, having been a major partner in their revolution. What transpired outside of our consulate in Benghazi was not an expression of deep-seated anti-Americanism on the part of the Libyan people. Quite the contrary. The counter-demonstrations, the outpouring of sympathy and support for Ambassador Stevens and for the United States, the government of Libya and -- and the people on the street saying how pained they are by this, is much more a reflection of the sentiment towards the United States than a small handful of heavily armed mobsters. TAPPER: That certainly, according to polling, is the case in Libya. Not the case in Egypt. And since you brought up President Morsi, let me try to get some clarification on something. President Obama was asked about the relationship with Egypt on Wednesday, and this is what he said. OBAMA: I don't think that we would consider them an ally, but we don't consider them an enemy. They are a new government that is trying to find its way. TAPPER: The United States has sent billions of dollars of U.S. taxpayer money to Egypt over the last few decades. And by definition, as you know, according to the State Department, Egypt is a major non-NATO ally of the United States. Why would President Obama say Egypt is not an ally? TAPPER: Was he trying to nudge Morsi? RICE: The president wasn't signaling any change in the nature of our relationship. Obviously, the president had a conversation with President Morsi and a very productive one, in which he underscored that it's, of course, the responsibility of the Egyptian government as host to protect diplomatic personnel and facilities, including our own, and we saw that President Morsi, immediately after that, took dramatic steps to improve the security of our facilities in Cairo and elsewhere, and then went out and repeatedly made a number of very important and powerful statements condemning the violence and conveying the message that, however hateful such a video may be, there is absolutely no justification for violence against the United States or other Western partners. So what we've seen is that the president has been incredibly calm, incredibly steady, and incredibly measured in his approach to this set of developments. And his interventions, his leadership has ensured that in Egypt, in Yemen, in Tunisia, in Libya, and many other parts of the world, that leaders have come out and made very plain that there's no excuse for this violence. We heard Prime Minister Erdogan of Turkey say the same, we heard the Grand Mufti in Saudi Arabia say the same, that there's no excuse for violence, that violence is to be condemned, and that governments have a responsibility to protect United States personnel and facilities and those of all foreign diplomats. TAPPER: I know you have to go, but very quickly, was the president in that interview trying to nudge President Morsi, "Get your act together"? RICE: No. I think that the president communicated directly with -- with President Morsi and had the opportunity to -- to understand our expectation that Egypt will do what it can to protect our facilities. So that -- that was conveyed very directly, and the results were immediate and quite satisfactory. TAPPER: Dr. Rice, thank you so much for coming here today and answering our questions. TAPPER: And we're joined now by my colleagues and friends, Martha Raddatz, Brian Ross, and Christiane Amanpour. Christiane, let's begin with you. You covered the Arab Spring. You had those exclusive interviews, we all remember, with Egyptian President Mubarak, Moammar Gadhafi in Libya, and with Mohamed Morsi, now the president of Egypt. And, Christiane, I know you've interviewed the prime ministers of Libya, Egypt, and the spokesman for the Muslim Brotherhood. What are they telling you about these protests? Who's behind them? And who's behind the attack in Benghazi? AMANPOUR: Well, what they're saying, first and foremost, is that obviously this has nothing to do with the governments, they don't support this, they've called them back, they say, and today the Muslim Brotherhood has said that we've made plenty of arrests and we should know in the next few days, that they're trying to recalibrate and put their relations with the United States back on the correct track. They're very, very concerned that this should not disrupt their relations with the United States, whether it's the Egyptian prime minister who told me that, the Muslim Brotherhood, the Libyan prime minister. And I think it's also important to recognize that this is a seminal moment, Jake, for these Arab emerging democracies. The people have spoken. By and large, they've gone well. By and large, this is a success story. But as we've seen, there are elements that are out of control, most particularly in Libya, where you've got these armed people who are not yet under the government control, not brought into the, you know, under the rule of law. But in Egypt, they say that they've got it under control, and they're very concerned that they want to maintain their relationships and not have this, you know, deter them from their strong relationship with the U.S.
TAPPER: Brian, let's talk about the homeland for a second. This week, there were three college campuses where there were bomb scares, apparently all false alarms, but they were false alarms. But they were called in. Is there a worry that these -- this wave of attacks could spread to the United States, to the homeland itself? ROSS: Well, there's concern, but those bomb threats washed out as a real threat. There was an arrest yesterday in Chicago, an 18-year-old who had wanted to blow up a bar in Chicago as part of -- sort of a sympathy for what's going on in the world against Muslims. But in general, they see no organized plan to disrupt or to attack in this country, but there are the independent operators who could be inspired. TAPPER: Martha, you've been to these embassies. How is security arranged? How is it decided who gets Marines, who doesn't? How do they decide, when the protests are coming, what they can do to calm things and -- and when they will actually make things worse if they get involved? RADDATZ: Well, I think that's a real fine line. In Yemen particularly, I was watching this week, and that embassy is very, very hard to breach. You have the host nation usually on the outer perimeter. They're in charge of security there. But getting inside, you usually have Americans there backing them up, whether they're contractors or security. If you saw those mobs coming, I suppose you -- you would say, "Let's go after them," but they can't really do that in all these cases. I think particularly in Yemen, they did a pretty good job of just letting them climb the walls, but not get over the walls. You don't want to use deadly force if you don't have to, because it makes it much worse. But there are a lot of questions, Jake. You asked a very good question of Susan Rice. Why weren't there Marines in Tripoli, in particular? TAPPER: She didn't answer it. RADDATZ: I'm pretty sure there are Marines in Paris. Why weren't they in Tripoli? And I think that's a question the State Department is looking at right now. And Benghazi, I think you had 25 or 30 people in the entire consulate. How many of those really were security? They overran the perimeter so quickly and were able to get to that main building so fast, that is a huge question. TAPPER: And, Brian, you heard them talk about the YouTube video. You heard Dr. Rice talk about the YouTube video. They're hanging a lot on this YouTube video. You've been looking into the guy behind -- some of the -- the filmmaker, the main filmmaker behind it. What was his motivation? Why did he, first of all, initially falsely claim to be a Jew, an Israeli Jew? And what was he trying to do with this video? ROSS: Clearly he was trying to stir things up with his false claims that he was an Israeli Jew, as he put it, that the money for this came from Jewish donors. In fact, the money came from his wife's family in Egypt, and he was attempting just to stir things up, I think, with this very provocative film. TAPPER: He's a Coptic Christian. ROSS: Coptic Christian -- the issues in Egypt between Coptic Christians and extremist Muslims. But he sought to create a hate film. The film was never really produced, just the trailer that was put on YouTube. ROSS: Like a home video. ROSS: I was going to say, it's so interesting that the actors that were called to say the words -- "Master George" was the main bad guy there. Then they dubbed in those three syllables with "Mohammad." AMANPOUR: I mean, it was clearly a film designed to incite. And it's a film designed by an extremist with extremist views here that plays right into the extremist provocateurs over there. But one thing I was really worried about, first of all, this cynical and dastardly attempt to stoke more hatred by pretending he was Jewish, and now it reveals that he's a Christian. You know, there have been very tense relations with Coptic Christians and Muslims in Egypt, and the one thing I asked the Muslim Brotherhood, is this going to cause a backlash? They said, absolutely not. We're standing absolutely firm. We're not going to let this have any impact on our relations, because that's possibly a very, very, you know, difficult fallout that could happen. I'm pleased that nothing happened in Afghanistan. I mean, I think what's really important is to know that, again, this is a seminal moment. These governments have mostly done the right thing, you know, not just now, but in the lead-up to -- to all of this. They're mostly moderate. They want good relationships with the rest of the world. Yes, the people are going to have a voice, because these are democracies now, in foreign policy going ahead. But as Susan said and as others have said, look, in Libya, more than half the people support not just U.S. leadership, but the United States and the people of the United States. So I think that should be the takeaway, I think. TAPPER: Martha, before we end this roundtable, I do want to look forward. And right now, we have in the gulf the largest naval exercise ever in the history of the Middle East. What is the message that the United States military is trying to send here? Is it directly aimed at Iran? RADDATZ: I think it's a pretty obvious message, and I don't think anyone would actually tell you that on camera, Jake. But I think it's pretty obvious the message to Iran is: Don't even try to shut down the Strait of Hormuz. They've got all these mine-sweeping exercises. It is an enormous exercise. Yes, they -- they normally do exercise, but nothing like this, and they're building up all sorts of missile-defense-type things in there, as well. TAPPER: And, Christiane, just looking forward, the United Nations General Assembly meets this week and there's a lot of tension right now between Israel and Iran, but also between Israel and the Obama administration. What do you anticipate will happen this week? AMANPOUR: Well, we've all been, you know, listening to how they're not going to meet the leaders of the United States and Israel. But I think what's really interesting -- and I've talked to a lot of people about this -- you know, Ehud Barak, the Israeli defense minister, is starting to walk back the idea of an attack on Iran's nuclear facilities. The internal intelligence and defense by and large inside Israel has been very lukewarm, if not downright negative, on the idea of a unilateral Israeli attack. I'm being told that -- that that's possibly sort of receding as a possibility, at least any time now. But then -- and, of course, the Israeli people do not want to see their country unilaterally attack Iran. And I think, really, what we have to know is whether there's going to be any real, significant chance for proper negotiations, this negotiation that's going on right now with Iran and the West and -- and the United States, whether that can come to some kind of agreement, beyond -- you know, short of a kind of military intervention. TAPPER: And, Brian, very quickly, because we're running out of time, what are your sources telling you about how far the Iranians are when it comes to actually building a nuclear device? ROSS: Four to six weeks away, if they'd made the decision to do it. ROSS: That -- that is some of the intelligence. But they haven't made that decision. That's the key. AMANPOUR: So, you know, this is a guessing game that's gone on for years. ROSS: Yes. Yeah, right, that's the latest claim. TAPPER: All right. All right, Christiane, Brian, Martha, thanks so much for joining us. Really appreciate it. Great insights. When we come back, our powerhouse roundtable weighs in on all the week's politics. KIMMEL: There's a new poll out today. It claims that 58 percent of Americans believe Barack Obama would beat Mitt Romney in a fistfight. Maybe we could wrap this election up tonight. We make it a Pay-Per-View -- we could wipe out the national debt in one night if we had them fight. TAPPER: With polls showing a slight Obama lead, is it time for Republicans to start worrying? And the iPhone 5, economic stimulus? O'BRIEN: Today Apple unveiled the iPhone 5, which is 20 percent lighter and 18 percent thinner. Yeah. In fact, it's just a piece of paper that says, "You saps will buy anything." (UNKNOWN): There is something I want you all to know. I'm not worried, not in the least. Our campaign has a secret weapon, and that secret weapon is speaking right now in Tulsa, Oklahoma. Let's take a look. ROMNEY: Hello, I'm Mitt Romney. And I understand the hardships facing ordinary Americans. For example, this summer, one of my horses failed to medal at the Olympics, so I know hardship. TAPPER: And we're joined now by George Will, Fox News contributor Liz Cheney, who's also the co-founder of Keep America Safe, retired General Wesley Clark, ABC's senior political correspondent Jonathan Karl, and Gwen Ifill, moderator of PBS's "Washington Week" and senior correspondent for the PBS "NewsHour." Welcome, one and all. Lots to chew over. George, this week, Romney's senior foreign policy adviser, Richard Williamson, said of the situation in the last week unfolding throughout the Muslim world, "There's a pretty compelling story that if you had a President Romney, you'd be in a different situation." Is there? WILL: No. The great superstition of American politics concerns presidential power. And during a presidential year, that reaches an apogee and it becomes national narcissism. Everything that happens anywhere in the world we caused or we could cure with a tweak of presidential rhetoric. Jay Carney participated in this when he said the riots in the Middle East are not about U.S. policy, they're about a video. Actually, they're about neither. If the video hadn't been the pretext, another one would have been found. There are sectarian tribal civil wars raging across the region that we neither understand nor can measurably mitigate. TAPPER: Liz, Mitt Romney was criticized a lot this week, not just by Democrats, but even by some of his fellow Republicans for responding too quickly and for what was he saying in his response. You actually are not among those critics. You think he got it right. CHENEY: I think he did get it right. I think that actually the statement this week that should have received more criticism and attention was the president's, when the president went into the Rose Garden 24 hours after the Cairo embassy attack, rightly, of course, condemned the killing of our ambassador in Libya, failed to even mention the Cairo attack. And, you know, I think that -- that in a situation in which an embassy has been attacked, the flag's been ripped down, the Al Qaida flag has been flown, that America's president not to even mention it clearly sends a signal to radicals across the region. And, you know, I would disagree with George to the extent that we've now had three-and-a-half years of Obama policy, and it looks an awful lot like, whether you're talking about the Mexico City speech in 2009, the Cairo speech in 2009, the extent to which he's been apologizing for America, he's abandoned some of our key allies, like Israel, Poland, Czechoslovakia, he's attempted to appease our enemies, the Iranians, for example, the Russians. He's now getting ready, as we watch these scenes unfold on the air, to slash our defense. And the defense sequestration includes over $120 billion for embassy security. And so the president himself's got a terrible record on national security. And it's clearly something that Governor Romney ought rightly to be pushing. TAPPER: I suspect, General Clark, that you disagree with what Liz Cheney just said. CLARK: I do disagree, because I think this is a consistent Republican narrative that Democrats are soft on defense, but we've a Democratic president who's been strongest on national security. He's completely taken the foreign policy and national security argument away from the other side. He reinforced in Afghanistan. He got us responsibly out of Iraq. We took Osama bin Laden. He's been firm. He's been visionary. He's been tough. He's decisive. So I know what the Republican narrative wants to be, but when you get below the rhetoric, there are no facts to support these charges. In fact, we've worked anti-missile defense. Poland's happy. Other nations in Europe seem to be happy. We've got the strongest relationship with Israel I think we've ever had. It's very good relations there. So I -- I just don't find much ground in these comments from the Republicans. TAPPER: And, Jon, let me just go to some polling, because I want you to weigh in on this. If you look at how the American people feel about who would be better when it comes to foreign policy and terrorism, trust to handle foreign policy, Obama, 51 percent, Romney, 38 percent, trust to handle terrorism, Obama, 51 percent, Romney, 40 percent. That was Tuesday, an ABC News-Washington Post poll, so obviously the events of this last week have not factored into it. Could the events of the last week change those numbers? KARL: They sure could. It's a question of where it goes. I mean, I think, Liz, despite what you're saying, I think even the Romney campaign thinks they mishandled the way they initially played this. Look at the difference in tone from Mitt Romney between when he came out right after the attack to where he is now. CHENEY: Well, the Romney campaign doesn't always get it right. KARL: Well, there you go. But -- but in terms of the longer-term implications here, this is really a potential, you know, danger for the president. There will be questions asked. No doubt there will be hearings up on Capitol Hill about what happened, why there was not more security in Benghazi. There will be questions about the overall situation in the Middle East. Was this really about one YouTube video or trailer for a movie that had been out, you know, for months actually and was finally translated into Arabic and put on an extremist television show in Egypt? Or is there something more fundamental going on? This was a president that was going to, you know, transform our relations with -- with the rest of the world, particularly with the Arab world, and now the Arab world is to a degree inflamed with -- with very visible anti-Americanism. That's the kind of thing that could potentially erode the president's numbers long-term, even though Mitt Romney severely mishandled the situation. TAPPER: And, Gwen, how much do voters care about foreign policy? How much could this actually change the course of this election? IFILL: ... nobody really -- I picked up on that. I picked up on that. But I find it striking that Liz would say the Romney campaign doesn't always get it right. That -- that shows a little bit of disagreement within the Republican Party about how this week went. But more interestingly to me, getting back to your question, I don't think people were paying attention to this, even though you can argue very clearly that this is the most important power that any president would have. So it boils down to a point that Mitt Romney was really trying to make, after all, the -- the timing issues, which is, who is in a better position to lead? The tough position, if you are the guy trying to take out the incumbent, is to make the case that you would be better. Of course the president does better in this poll, because he is the president. He is currently the commander-in-chief. But I don't know that Americans, when they go to the polls in the end, are going to say, "Well, I think I like the way he handled Benghazi." He's going to say, "Does he feel like a leader to me? Does he feel like someone who could be president?" And that's -- that's -- that's what was tough for Mitt Romney this week. CHENEY: I want to clarify. I think that the governor handled it exactly right when he went out and condemned the embassy statement. Jonathan's point that the campaign now feels like it needs to back is where I would fault them, if that is true. I cannot imagine a more important set of issues. And I think, frankly, you know, it would be a tragedy for the nation if President Obama is allowed to effectively claim that he's been a successful national security president. And it'd be a tragedy for the nation if the Romney campaign doesn't push this issue very hard. I know how deeply Governor Romney cares about the country. So I hope very fervently that they will continue to push this hard. But there's no question but that we're weaker than we were when Barack Obama took office, and if he has four more years, we may well be unrecognizable. CLARK: Actually, I don't think we are weaker. I think the whole point of going into Afghanistan in 2001, which President George W. Bush articulated, was Osama bin Laden, wanted dead or alive. And it was Barack Obama who really put the pressure on and got him. IFILL: There it goes again. Once again, Osama bin Laden. KARL: Are you at all uncomfortable, though, with how political that -- I mean, that at the -- at the national political convention, that this military operation is used as a -- as a political talking point over and over again? KARL: The vice president talking about putting him on bumper stickers? CLARK: We've had, since the Vietnam War, the consistent refrain has been Republicans are the daddy party, Democrats are the mommy party, Republicans are strong, robust, Democrats are soft and weak and want to negotiate, want to apologize. It's simply not true. We're stronger. We're safer. Barack Obama has been a very robust, muscular -- has a very robust, muscular foreign policy. And as George said earlier, what's happened in the Middle East has lots of factors and lots of causes underneath. It has nothing to do with rhetoric from Washington. WILL: (inaudible) list of muscular actions by the president, you could add the use of drones, which has been extremely aggressive, more aggressive both in the number of attacks and the places where the attacks are made than under George W. Bush. I really do not think it's fair to fault the president for throwing Israel under the bus, as they say. Granted, he has a bad relationship with my good friend, Netanyahu. But the relationships between the U.S. military and the Israeli military, which is 98 percent of the point of this relationship, are quite good. But politically, our profession, graphic journalism, with all these pictures of things in flames, tends to give the country the sense that the world is somehow in chaos. The world's always dangerous and all that, but the chance of dying on this planet from organized state violence is lower than it has been since the 1920s. IFILL: It's the disorganized state violence, I think, or non-state violence that everyone's worried about when they look at a map and see protests in 20 different places. WILL: Yes, but it -- but it -- but it beast the heck out of wars. CHENEY: But with respect to the state of -- but with respect to the state of Israel, George, look, you're in a situation now, in the last 48 hours, the president of the United States reportedly has offered to meet with the Muslim Brotherhood president of Egypt, who at a minimum allowed the attack on our embassy and has refused to see Benjamin Netanyahu. There's simply no way that you can claim that that relationship is not strained. WILL: It is unpresidential peevishness. I take that point. CHENEY: And given -- and given the fact that Israel's facing an existential threat, which is also a threat to the U.S., with respect to a nuclear-armed Iran -- and, frankly, the one effective program that we may have had in place that would have been able to slow or stop that nuclear program, the Stuxnet cyber warfare activity, which according to the New York Times, members of the president's national security team leaked to them. So this -- this president's record is clearly abysmal. CLARK: Well, look, I want to say (inaudible) this question about refusing to meet with Netanyahu. I'm not in the administration, so I wasn't a part of this. But I ask it. I don't think there's been any direct request to meet. And I don't think there's been a refusal. There's daily contact between Israeli government officials and the United States. Secretary of State Clinton has been out there meeting people. We know very well the positions on all sides. The uncertainties, the intelligence, the information is shared. Planning is shared. It's very close. This is a question of the best way to bring this Iranian program to a halt. TAPPER: And on that subject, George Stephanopoulos interviewed Mitt Romney this week and asked about the red lines, where the U.S. will draw the line in the Iranian nuclear program -- nuclear weapons -- alleged -- before acting. And here's that exchange. STEPHANOPOULOS: The red line going forward is the same. ROMNEY: Yes. And I recognize that when one says that it's unacceptable to the United States of America, that that means what it says, you'll take any action necessary to prevent that -- that development, which is Iran becoming nuclear. TAPPER: George, where does Prime Minister Netanyahu want this red line to be publicly drawn? We've heard so much about this red line. President Obama has not stated what it is. Mitt Romney has not stated what it is. What does Bibi want? WILL: I'm not sure what he wants, because I'm not sure how you draw red lines when you can't have confidence -- not from incompetence, but just the limits of knowledge -- confidence in our intelligence system. Last March, in an interview with Jeffery Goldberg of the Atlantic, President Obama said our intelligence service will give us a pretty long lead time in understanding where Iran is. Our intelligence services did not predict India's testing of a nuclear weapon, Pakistan's testing, didn't anticipate, didn't predict North Korea's, so I think he may have a faith in the ability of our intelligence services to draw lines and put down markers as to where the Iranian program is that we simply actually don't have. TAPPER: And, General Clark, does the president -- I mean, is it in the president's interest to publicly state what the red line is? Doesn't that mean that he then has to go to war? CLARK: No, he's not going to state a red line. There probably are several different indicators, and there's going to be a margin for uncertainty, because everyone understands that intelligence, as George said, is not precise. It's been sharpened up a lot. It's clearly a subject of focus that we didn't have on India and Pakistan, so that's not -- you know, it's not a direct comparison. We're doing better on that intelligence. But he's going to have -- no president can publicly declare red lines. That surrenders his decision-making authority. He's going to evaluate a number of factors. He's -- he's been very clear they're not going to get a nuclear weapon. He says it's unacceptable. He's decisive. Osama bin Laden found that out. And if I were the Iranian leaders, I'd be very concerned. IFILL: So do we know what Mitt Romney was saying in that interview with George, when he said he agreed with the president that there should be a red line? If we don't know what the president's red line is, and Mitt Romney and his advisers have said in the past that they actually agree more with Bibi Netanyahu, was Mitt Romney again backing away, getting softer on this issue, in agreeing with the president? IFILL: But, Liz, I'm still trying to figure out how President Romney would be different, if he's agreeing with the president on this issue? CHENEY: One -- one issue -- it seems to me the problem the Israelis have here, number one, I think they understand America intelligence is probably not as good as theirs is in predicting. Number two, they don't believe this president. They don't take him at his word. So the president says, you know, I'm not going to allow this, and then the chairman of the Joints Chief is traveling around saying, gosh, the worst thing that could happen would be an Israeli strike. I think the -- you know, the Israelis would understand with a President Romney that -- that he actually means what he says, that we're not going to allow, frankly, even nuclear capability. It's not just waiting to get a weapon. It's the capacity to have that weapon. TAPPER: I want to switch topics right now to a hardening we've seen in conventional wisdom about the state of -- of the -- of the election. We've seen in -- in Friday, these three swing state polls came back indicating, in Ohio, Obama's up 7 points, Virginia, Obama is up 5 points, Florida, Obama is up 5 points. And, George, one of the amazing things is, Mitt Romney is no longer in polling beating Obama on trust to handle the economy. WILL: Which is his campaign in one sentence. Those three states have one thing in common: They all have Republican governors. And all three Republican governors are bragging -- perhaps rightfully so -- that they have got their economies up and running. If you add Wisconsin, with Scott Walker, and -- to that list, you have a tension, a kind of disconnect between the interests of the Republican governors in the swing states and the interests of the Romney campaign. TAPPER: Jon, what's going on behind the scenes here? KARL: Well, look, one thing that's happened is, during the Democratic convention, the Romney campaign essentially went dark. And what you have seen is just an absolute bombardment, particularly in Ohio and in -- and in Florida, from the Obama campaign hammering Romney on -- especially in Ohio on the auto bailout. I mean, there was a Romney adviser who told me that that famous headline that Romney himself did not write, "Let Detroit Go Bankrupt," could be the headline that costs the election. They have gone in and actually outspent dramatically the Romney campaign over the last few weeks, which is incredible, when you think that the Romney campaign actually has more money. WILL: It's particularly interesting because the automobile companies went bankrupt. And so you're -- the argument between Romney and the administration on the auto bailout is one of nuanced degree and law. CLARK: ... because what President Obama has said is there is a way to move this economy forward, and -- and Governor Romney's plans don't -- they really don't show that way. I mean, he's talking about tax cuts for the wealthy, closing loopholes, and sort of letting things take their course. And that's been his philosophy. KARL: Although -- although -- although you had the Obama campaign entirely talking about something that happened during the first six months of the Obama administration. CHENEY: General, why -- General, why then do we have more Americans unemployed at any time than since 1980? I mean, I think this administration has, at best, a real misunderstanding between the difference of -- about the difference between, you know, activity and action. And I thought what was particularly interesting was that at the Democratic National Convention, certainly not from the president, you never heard the word "record." They don't want to talk about it. They can't talk about it because the record has been so bad, as bad as we just were talking about it's been on national security, it's been worse on the economy. IFILL: We can talk Ohio. TAPPER: ... no, before we take the break, go. IFILL: OK. We can talk about Ohio, which is about the bailout, but you talk about Virginia and Florida, you're talking about different things, especially in Florida, where we're talking about Medicare, and those are the ads, and that's the spending, and that's the rhetoric, especially with the addition of Paul Ryan to the ticket, which has got people paying attention. In Virginia, in many ways, it's the northern part of Virginia which is more susceptible to what's happening in Washington and is listening to the debate more closely. And in the southern part of Virginia, which is more military and seems to be susceptible to the argument that the Obama administration is making. Because we live in Washington, we're seeing a lot of these ads. And we cannot underestimate how much of this has to do with the unpopular governors in Ohio and Florida and how much of it has to do with the effective advertising in all of those states. TAPPER: OK, we'll be back in 60 seconds with more of our powerhouse roundtable, but, first, a bit more from "Saturday Night Live's" season premier last night. (UNKNOWN): I'm Barack Obama, and I approve this message, but I'm not real proud of it. (UNKNOWN): After Bain Capital shut down the mill, I was out of work for a year. Next I worked as a trucker, but then Bain came along, bought the trucking company, and I lost that job, too. Finally, I got a job at a shoe-shine stand, under an assumed name, working just for tips. But Bain somehow found out, bought the business, and moved it to China. That's when I knew: This is not a coincidence. (UNKNOWN): Each time Raymond McCoy (ph) got a new job, Mitt Romney and Bain Capital would buy the company, apparently for the sole purpose of laying him off. KIMMEL: Here's another thing that will amaze you. You don't even have to order the iPhone. Apple has collected so much information about you, it already knows if you want it. It's coming to your house. FALLON: A lot of people are complaining that the new iPhone 5 is taller than the last model, which means they have to buy a new case. In response, Apple issued an official statement saying, "Exactly." 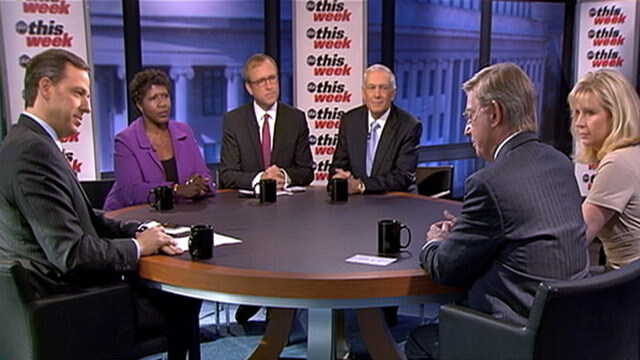 TAPPER: And we're back now with the roundtable. And as you saw right there, a lot of talk this week about the economic impact of that new iPhone being released by Apple. Take a look at this. JPMorgan estimates the iPhone could add $3.2 billion to the nation's GDP in the next quarter alone. But the Federal Reserve is not counting on Apple. They also announced some steps this week to boost the economy, embarking on a new round of what's known as quantitative easing, which is bond buying, $40 billion of mortgage-backed securities each month to help boost the economy. George, I'm just taking a guess that you're not a big supporter of this. WILL: Well, quantitative easing is how the government talks when it's really eager not to be understood. Quantitative easing -- quantitative easing is the government printing money. Now, printing presses are so 20th century. They do it digitally. Never mind. It's -- it's expanding the money supply. And it's part of not mission creep, but mission gallop on the part of the Fed, which is on its way to becoming the fourth branch of government, accountable to no one and restrained by nothing, as far as I can tell, in exercising both monetary and fiscal policy. The interesting thing is this. It used to have one mandate: protect the currency as a store of value, prevent inflation. Then we added a second mandate, maximize employment. Now we've forgotten the first and concentrated solely on the second to produce trickle-down economics. The whole point of this is to drive people into -- out of bonds and into riskier assets, such as equities, great effect on the stock market, where the equities are owned by a tiny portion of the American people, in the hope that the wealth effect, as the stock market goes up, will cause the wealthy in America to spend and invest, and the results will, guess what, trickle down to the rest of us. Now, banks have $1.5 trillion in reserves. Companies have $2 trillion of cash sitting on the sidelines. Who in America is not buying a house because of a 30-year mortgage at 3.5 percent is too high? Who is not hiring workers because lending is too expensive now? CLARK: I think the thing is, inflation is under control. Yes, there's a lot of money out there. It's not moving. We're keeping interest rates low. We're giving opportunities for investment in housing and other sectors. But it's got to be coupled with other measures, so the president's announced the new target, to get rid of half of our oil imports by 2020. That will put another $150 billion, keep it inside the U.S. economy. It's a big deal, and it can be done. He's announced new manufacturing initiatives. We're bringing jobs back from overseas. And we need to -- to move forward and do something about the home mortgage foreclosures. So there's been some efforts on this. There's some frustration on this. We need some bipartisan work on this. I remember debating Karl Rove in -- in 2008 on this, and he was very, very firm that we're not going to help people who have home mortgage problems. But when you've got more than 5 million home mortgages out there underwater waiting for foreclosure, I think we need some action on it. CHENEY: Look, what this is, is the Fed printing money in order to pay for Barack Obama's debt. And the one thing in your litany you didn't mention, General, is the debt. This country is facing a crisis that's a totally unavoidable crisis, $16 trillion we hit during the Democratic National Convention. And the extent to which this president has shown absolutely no leadership to deal with it, you've now got the Fed stepping in. You've now also got another credit -- credit rating agency in just the last 24 hours downgrading the United States of America. That has never happened before, and we've had it happen now twice on President Obama's watch. IFILL: Well, Liz brings it back to politics. What I'm saying is that you look at this completely through a political lens. Ben Bernanke, every time he steps up and doesn't do something like this, people go, oh, no, the markets go down. He comes up and does it, and people say, a-ha, this is a way of getting the president elected. The problem is that nothing he announced this week is going to make any difference in the next seven weeks, except it's going to create the idea that something is being done, and that's what I think everybody here is talking about, this idea that something is being done, not necessarily something that will have an immediate effect. CHENEY: But it's -- but it's an economic argument. I mean, I -- it does have a political impact because we're in the middle of a presidential campaign. But when the Fed is printing money in order to buy debt, you know, it's -- it's an economic argument. TAPPER: All right. Thanks to all of you. The conversation will continue online. General Clark, Liz Cheney will answer your questions on Twitter @generalclark and @liz_cheney. Just use the hashtag #this week. TAPPER (voice-over): Three moments from "This Week" history. What year was it? (UNKNOWN): We have raised this memorial to commemorate the service and sacrifice of an entire generation. TAPPER: The World War II Memorial opened. STEPHANOPOULOS: It's taken 17 years, almost three times as long as the war it commemorates, for the memorial to go from idea to reality. TAPPER: We learned about the torture of prisoners at Abu Ghraib. (UNKNOWN): I'm appalled. That is not how the American military acts or should act. TAPPER: And 52 million people watched as "Friends" signed off. SCHWIMMER: Please stay with me. I am so in love with you. TAPPER: Was it 2003, 2004, or 2005? We'll be right back with the answer. TAPPER: So what year was it? When did the Abu Ghraib prison scandal break and the World War II memorial open? It was eight years ago, 2004. And now "In Memoriam." We honor our fellow Americans who serve and sacrifice, including those killed in Benghazi, Libya. OBAMA: Four Americans, four patriots. They loved this country. They chose to serve it, and served it well. CLINTON: We owe it to those four men to continue the long, hard work of diplomacy. TAPPER: This week, the Pentagon released the names of three soldiers killed in Afghanistan. And finally, "Your Voice This Week." Today's question comes from Nancy Burkley who asks, "Who are you going to vote for?" Nancy, the truth is, I don't vote in races I cover. After I became a reporter, I found that, after I voted absentee ballot on a race I covered, it felt like I'd made an investment, and it was an uncomfortable feeling. So while I believe an active voting public to be vital to our republic and I revere voting, I don't feel as those I can do the best job I can bringing you fair and impartial coverage of politicians if I feel in any way invested in those politicians. Now, other reporters feel differently. And I in no way judge that. I'm not trying to be holier than thou. This is just my personal view. And just a reminder. You can ask me questions all week long on Twitter @jaketapper. We'll be right back. TAPPER: That's all for us today. Thanks for sharing part of your Sunday with us. Check out "World News" with David Muir tonight. George Stephanopoulos will see you back here next week. And Happy Jewish New Year.